Winter is settling into the Queenstown area but not everyone is tuning up the old snowboard. Whilst many of our southern rivers are now closed for the winter there is plenty of excitement still to be had in our larger Southern lakes. By now the browns will have taken off up our major rivers to spawn, but there will still be a few stragglers cruising the drop offs and river mouths, and along with numerous rainbows starting to gather, will be willing to accept ones fly. Woolly Buggers, Grey Ghosts, Rabbits and Mrs Simpson’s are always productive, and one never overlooks the deep drifted bead head around the drop offs. Traditional tactics dictate a range of sunken lines and streamer patterns, but one is always thinking, how can we make this a little more productive? This season past, my good friend, and successful Ireland competition angler / guide Ronan and I shared a few afternoons on the water. Being easily accessible much of our time was spent on lake Wakatipu itself, either throwing from the shoreline or drifting from the ‘Wakatipu Warrior’, our sometimes-trusty fishing club boat. I was fortunate enough to be introduced to an interesting array of techniques regarded as Irish ‘loch style’. Time after time, Ronan would come out on top with his team of flies arranged carefully to suit the conditions. So what is loch style you ask? The following is but a brief introduction to the fundamentals of ‘loch style’. Further elaboration on specific techniques may follow at a later date. - Each fly responds to the inclusion of the others, wether via movement, or a suggestive relationship between the team. - Each fly can be designed to behave in a different manner, or to present differing food sources / imitations over a range of depths. - A team of flies, fished correctly can suggest predator chasing prey, inciting an instinctive reaction from trout to compete for the prey. 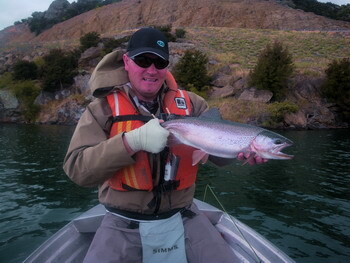 Otherwise sullen or wary trout may simply ‘go for it’. Over the past couple of months I have been experimenting with these techniques with impressive results. For the most part, I fish a team of three flies, and have slightly adapted the loch style concept to what I believe better suits the larger expanse, and dynamic of Wakatipu. Traditionally the top, or ‘bob’ fly is a fuzzy, buoyant dry fly type variant designed to create an enticing disturbance as it’s drawn along subsurface. On Wakatipu, I have found the good old Woolly Bugger to suit the bob position well, and with its large, not very air resistant design casts better closer to the fly line. My ‘middle dropper’ varies with success, but my selection often rotates around a range of flashy attractor patterns, something to get the fish going. This is usually slimmer and a little more aerodynamic than the bob fly, wether of streamer, or nymph design. The bottom, or ‘point fly’ of choice is usually a weighted monsums bully imitation, a smoothly tapered, aerodynamic weighted pattern deadly upon our southern lakes. A slim, weighted pattern on point is important in assisting in turnover of the leader. Ronan explained to me that by rigging the bob and middle flies on separate droppers one would achieve a much more attractive action than if attached directly onto the leader ‘kiwi dropper style’. I noticed with interest his droppers were each several inches long, long enough to facilitate a couple of fly changes if requ ired, yet controllable and largely tangle free. A stiff nylon such as maxima would be an advantage here, minimising the flies’ chances of tangling around the leader. The distance between flies too varies according to conditions. In normal conditions I will often hang my middle fly around 3 feet from the bob fly, then tie off my point fly a further 4 or 5 feet below. It is important to consider, particularly if fishing by oneself that too longer distance between the bob fly and point will make netting fish difficult if the top fly reaches the rod tip. In rough water, or windy conditions I would shorten these distances accordingly, dropping down to two flies in heavy winds to avoid tangles. It is important for the distance between the mid fly and point to be greater than that between the bob and middle fly. This assists in a more even turnover and more tangle free presentations. That’s a Paul Arden tip. Whilst most commonly fished from a drifting boat, I have been using this set up increasingly with much success from shore. Simply pitch the line out there into the lake and strip it back in at a steady pace. That’s it! Really! Could that be any easier? The theory behind this is that instead of seeing the one enticement moving through the water randomly by itself, the fish sees the whole team, apparently chasing after the bob fly – the whole predator / prey thing. I remember as a kid down Taieri Mouth, and Grandad tying a grey ghost a metre above my black and gold toby. You guessed it – the streamer got them every time! Trout can become rather competitive when it comes to food, and the sight of one fish chasing its prey will often incite the tout into joining the chase. This incidentally is one of the theories, which abound as to why a large percentage of the takes are to the bob fly, so tie that top fly on good. If fishing my favoured flats south of Staircase creek I will employ an intermediate sinking line and a rather fast retrieve. One of the traditional ideas behind a quick retrieve is to give the fish a fleeting glance of the attractor fly whizzing past, so it then gives chase. Over the deeper drop offs or where currents are present around river mouths I move to a higher density sinking line. Vary the depth and speed of your retrieve, and pause every so often to allow the flies to fall. Often this is when the takes will come when fishing deep. When casting this three fly rig it pays to open up your loops a little to avoid collisions upon turnover. Widening your casting arc by rotating more throughout your stroke is one of the ways to achieve this, and casting more elliptical style with a horizontal back cast, and an overhead forward cast will also make easy work of presenting your team. If casting ‘belgiun style’ simply open the forward stroke to keep ones flies well away from the rod leg of the loop. It is also important to ensure your flies land in a straight line, as opposed to piling upon one another as they hit the water. With droppers and multiple fly rigs, the last thing you want is to spend all day untangling presentation after presentation. To improve turnover of this less than aerodynamic rig, shoot your final cast through your fingers, clamping down on the line as the loop unfurls. This will ensure a clean, efficient turnover every time. 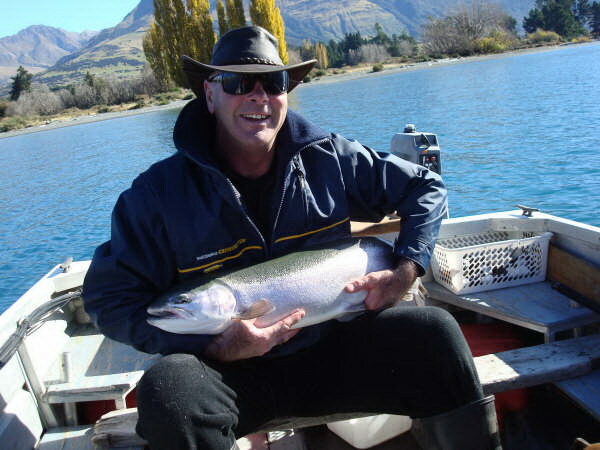 Loch style presentations sure aren’t new, and I’ve since met others who have been employing this method on our NZ still waters with more than satisfactory success. I have myself only been playing with these methods but a short time, yet the more I learn, the closer I believe I am coming to cracking the code of our larger glacial lakes. Enjoy the winter season, experiment with patterns and presentations but most importantly get out there – you won’t catch trout in front of the heater!